For some people, a morning workout is the ideal way to start the day. For others, that early morning exercise session is completely exhausting and dreadful. Although early morning crabbiness could be to blame, your body's physiology provides a better explanation for why morning workouts are more exhausting than afternoon workouts. Your exercise exhaustion in the morning may be caused by a low fuel supply. Much like a diesel-driven engine, your body requires fuel to keep it moving. By the time you wake up in the morning, your supper from the night before has already been digested and your blood sugar could be low. To provide new fuel for your morning workout, aim to eat a healthy breakfast at least two hours before your workout. If you workout just after waking up and can't make time for breakfast, try to consume a sports drink or light snack at least 20 minutes before exercising. Forgetting to fuel your body will likely result in extreme sluggishness and exhaustion. Since most people have eaten plenty of food by the afternoon, your body typically has plenty of fuel for a mid-day workout. From morning to afternoon, your body's internal temperature raises a few degrees. Although this change is usually minimal -- about 2 or 3 degrees -- it can have a significant impact on your workout. As your internal temperature increases, your muscles become more flexible and agile. As a result, you can exercise for longer before your muscles fatigue. And since your lungs also work more efficiently during this temperature peak, your entire body is able to handle a longer and more intense workout before exhaustion sets in. 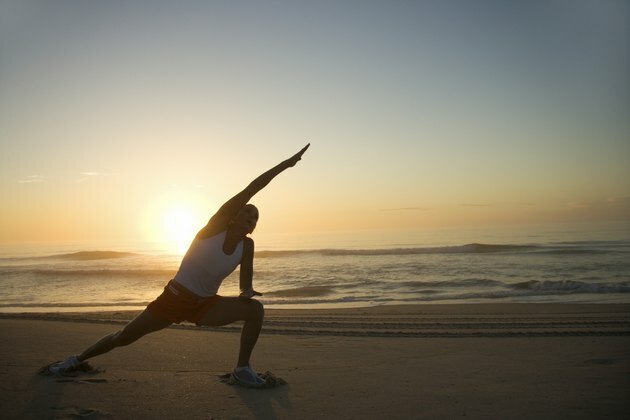 If you choose to workout in the morning, warm up and stretch your muscles thoroughly before beginning your workout. Forgetting to warm up could increase your risk of injury and set you on a direct path to quick exhaustion. Your circadian rhythm might also be to blame for the exhaustion you feel during a morning exercise session. Your circadian rhythm is an internal rhythm of the brain that regulates the entire function of your body. Originating in the hypothalamus of the brain, these silent rhythms determine your body temperature, blood pressure, energy levels, metabolism and normal sleep-wake schedule. Unfortunately, our early morning alarm clocks and frequent late nights tend to override this natural rhythm. As a result, your body may have a difficult time catching up in the morning. If you have not received a sufficient amount of sleep, your circadian rhythm is still sluggish in the morning. As a result, your energy levels, pulse and blood pressure also remain sluggish. Personal preferences also play an important role in determining the ideal time of day for exercise. For some people, a morning exercise session is the perfect way to start the day. For others, rolling out of bed and into gym clothes is a dreadful notion. On the other hand, some might find an afternoon workout to be an effective way of relieving stress and building energy for the rest of the day. For others, exercising in the afternoon zaps energy levels. The ideal time of day for exercise varies from one person to the next.